"She shifts in her seat. She cranes her neck. She squints. She carries on, flying blind. a jagged line between where-I-am and not-quite-sure." In May of 1932, Amelia Earhart boarded her red Lockheed Vega plane and set off on a solo flight across the Atlantic Ocean, from Newfoundland to Northern Ireland. Her flight wasn't without challenges and despite inclement weather, a broken altimeter and other mechanical problems, she endeavored on to become the first woman to fly alone non-stop across the Atlantic. The talented Robert Burleigh takes readers along on this incredible journey by describing the flight in dramatic verses. His emotion-filled version of the harrowing, forever famous fifteen hour trip is an exceptional biographical work about Amelia Earhart, the bold and courageous aviatrix and her amazing trip. Robert Burleigh on his website describes his book writing goals stating, "I like the book to convey the feeling of immediacy." Truly, while reading Night Flight it does seem as though you are right there, accompanying Earhart every step of the way. Wendell Minor's illustrations add to the drama and suspense, skillfully showing the white-knuckle, heart pounding moments flying over a churning ocean in darkness and finally the beauty and relief after a successful flight. Minor carefully researched the specifics of Earhart's plane before making the illustrations so that he could provide historically accurate paintings. The endpapers show a schematic of the plane and a map illustrating Earhart's flight path across the ocean. An afterward and other notes and quotes provide background information pertaining to Amelia Earhart's life. Powerful, brilliant, fascinating, beautiful -- both my children sat quietly listening and hung onto every word as we read the story and took in the pictures together. What an incredible way to experience a moment of history, a remarkable night flight, and learn about the woman who at one time declared, "Everyone has his own Atlantics to fly. Whatever you want very much to do, against the opposition of tradition, neighborhood opinion, and so-called common sense -- that is an Atlantic." We stopped at Michaels this weekend, and I noticed some of the Creatology wooden kits were on sale. 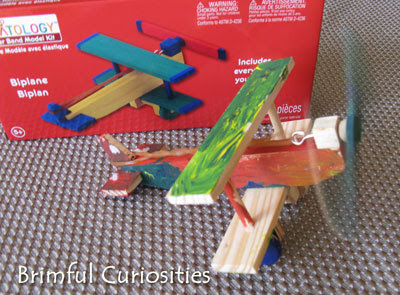 My son enjoys painting and gluing the wooden models, and I knew right away he'd love a rubber band powered biplane. He painted the plane parts yesterday, and I helped him glue the plane together. When twisted and released, the rubber band powers the spinning propeller. 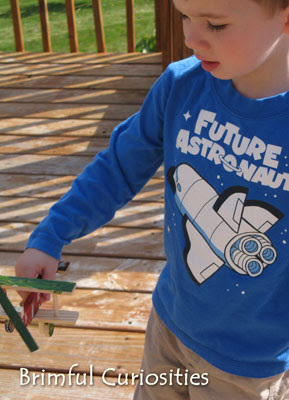 You can't beat the value of wooden kits - this one was a cheap, exciting and educational project that only cost me 75 cents! While the biplane isn't the same as the Earhart's Vega, it still is a nice tie-in project and the plane has a spinning propeller just like the one portrayed on the cover of Night Flight. 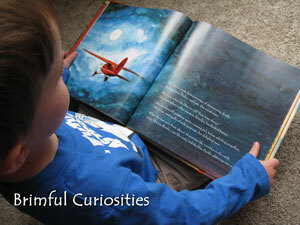 I nominated Night Flight in the 2011 Cybils Non-Fiction Picture Books category because I think the book is award worthy. 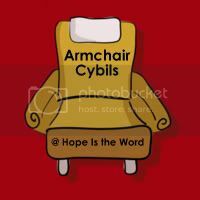 Amy at Hope is the Word is hosting an Armchair Cybils challenge. This is my first blog contribution for the link-up challenge. Look for more review posts in the next few months as my family reads several of the nominated Cybils books. Also, head on over to Amy's blog if you'd like to join the challenge. We read this book recently, and my kids loved it too! It's so nicely done, both the text and illustrations. We'll have to look for those Creatology kits! This looks like a great book. I love the airplane. Those kits are pretty fun to do. Thanks so much for joining in the Cybils Armchair Challenge! 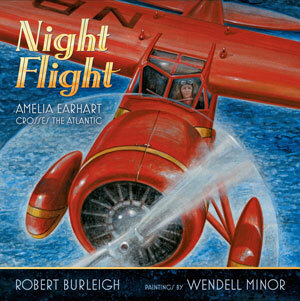 I will most definitely have to look for this one because my older dd read and re-read a DK biography of Amelia Earhart last year. I'm reviewing Amelia Lost for Cybils in the middle grade/young adult category. I think it fascinating how the authors are able to pare down so much information to the essentials. Looks like a lovely book.Thanks for linking up to Book Sharing Monday.